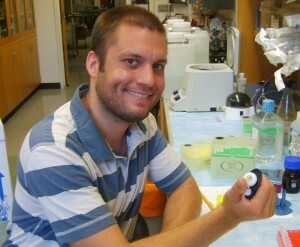 BHD Researcher Interview: Tim Cash is a doctoral student at the Abramson Institute, University of Pennsylvania, USA. I became interested in BHD about seven years ago while working on Tuberous Sclerosis Complex in Lisa Henske’s lab at Fox Chase Cancer Center. I came across BHD in the literature, was struck by the clinical similarities between the TSC and BHD and thought there must be a connection on the molecular level. I’m currently analyzing the effects of BHD on chromatin—specifically at Smad-depedent promoters. I’m also looking for a post-doc where I can pursue new avenues within the BHD field. I think developing model organisms to study BHD would be of great help to the field, because they’re so amenable to genetic screens and unbiased experimentation. I think the work being done on the crystal structure of BHD is the most fascinating thing going on, and will reveal alot about what Folliculin is doing in the cell! The Cancer Cell paper from Laura Schmidt’s group where they cloned the BHD gene, which started this research for us all. My short term goal is to find an academic postdoc which will allow me to continue work on BHD, preferably in a foreign country where I can learn a new language and culture. My long term goal is to figure out what Folliculin is doing in the cell—I hope this goal is not too long-term in nature. I foresee BHD being placed firmly in a signal transduction pathway first. Then I see its direct biochemical function being elucidated. This will inevitably lead to targeted therapeutics for patients. I wanted to be a physician, but realized later in life I was more interested in science. I see myself continuing to do cancer research, hopefully in the capacity of a Principal Investigator in 10 years. I can’t remember where I saw this, but I once read that it’s more important to think about what experiment NOT to do, rather than what experiment to do. I think of this all the time and it helps keep me focused. All the great scientists who have changed the way we think or understand science such as Darwin, Mendel, Watson and Crick. BHD Personal Story: Ruth, who is from the UK. I have had skin lesions since my early twenties to my face, upper body and waist. These have become increasingly worse. I was looking for a way to remove them so I studied the internet to first try and identify what they were. It was the BHDSyndrome. org website which I came across when searching for photographs of different lesions. It was bizarre, I realised immediately that the pictures looked exactly like my skin. I initially felt guilty because I was going to bring so much worry into the lives of my family. I also felt as if I had disappointed my husband (we are recent newlyweds). I felt like ‘faulty goods’. My family have all been told, as there has been no family history it must have been a shock for them. My mother volunteered to tell them and we made sure that everyone was told on the same day. I had prepared some bullet points to leave with them so that they could think things through rationally later on. We all agreed that there would be little mileage in telling my father due to his own deteriorating state of health. My mother is going to have the gene test to establish which family line it exists in. My siblings (all boys) have been fantastic. Their immediate concerns were regarding my current state of health, they wanted to know that I was OK. All of my brothers have children and therefore they are concerned enough to all want to have the genetic test. I remain hopeful for them all, this is based on the fact that they do not have skin lesions and are all aged between 40 and 50 years of age. As I mentioned previously, the BHD Syndrome website was absolutely great. It is the information from here that I printed off and took to my GP. When I knew that there was a problem, I used the same information to discuss and explain things to my mother. Read the information on the website, take information to your GP to help them to understand your concerns. My GP was pleased that I had done the research. Multiple skin lesions. I am currently waiting for a detailed MRi scan. Prior to my diagnosis I had a “Lifescan”, this was because I had previously been a smoker and wanted to know that my heart and lungs were ok. The Lifescan showed up two cysts, one on my liver and one on my kidney. Obviously I am anxious to complete the MRi scan to ensure that these were just simple cysts. None, but considering a medical skin peel to see if I can improve my skin for a while (still a bit vain at 45 years old)! My GP was great, she admitted that she had not heard of BHD but was interested and referred me to Mr Bruce Gee a consultant dermatologist at Warwickshire Nuffield. When I met him I was relieved to find out that he knew all about BHD and arranged immediate biopsies. When fibrofolliculomas were confirmed he then referred me to Dr Lim at Birmingham Women’s Hospital. Dr Lim came to see me and carried out the genetics testing. He is an expert in this area and he explained everything I needed to know. He was genuinely interested in how I felt and has been available to talk to if needed. I already had insurance in place, so far so good. Just to complete my MRI scan and get on with enjoying the rest of my life. My advice would be to get regular checks and do not spend time worrying about what might happen in the future. Whatever age you live to, it would be awful to look back at your life and realise you wasted your time worrying about something that you could not have changed.